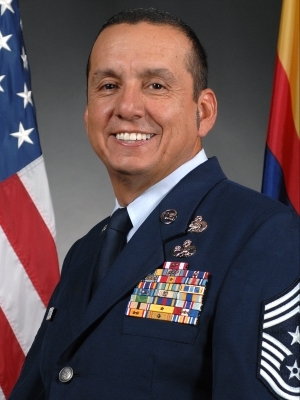 Chief Master Sergeant Armando A. Gonzalez is the State Command Chief Master Sergeant for the Arizona Air National Guard, Papago Park Military Reservation, Phoenix, Arizona. He represents the highest level of enlisted leadership and serves as the Senior Enlisted Advisor to the Commander of the Arizona Air National Guard. Chief Gonzalez is responsible for matters influencing the readiness, health, morale, welfare, and professional development of more than 2,500 Arizona Air Guard members. Chief Gonzalez entered the Air National Guard in April 1986. His background includes assignments as an F-16 Dedicated Crew Chief, Inspection Element Superintendent and First Sergeant with the 162d Maintenance Group, and Logistics Readiness Squadron Superintendent with the 162d Mission Support Group, Tucson, Arizona. In 2014 Chief Gonzalez deployed in support of OPERATION ENDURING FREEDOM as Logistics Chief, 557th Expeditionary REDHORSE Squadron, Al Udeid AB, Qatar. Prior to his current assignment, Chief Gonzalez served as the Command Chief Master Sergeant, 162d Wing, Tucson, Arizona. 2006 USAF First Sergeant Academy, Maxwell AFB, Ala.
2010 Green Belt, Lean/Six Sigma, NGB Joint Continuous Process Improvement, Washington, D.C.
2012 Chief Executive Course, Washington, D.C.
9. September 2008 - October 2009, Support Supervisor, 162d Aircraft Maintenance Sq, Tucson, Az. 10. October 2009 - October 2010, Inspection Element Superintendent, 162d Maintenance Sq, Tucson, Az.